Everybody knows how annoying it is when you lose your phone signal. At best, it is disruptive. It can destroy your plans or itinerary. It can upset your partner, client or boss, and it can seriously impact your day. At worst, it can be a wall of silence between those who depend on us most – the vulnerable young and old in society who may also find themselves in an emergency. Sometimes a single bar of signal can prove the difference between life and death, this is a serious responsibility- one that also raises concerns of liability. In most large buildings, it is generally the owners who take on this care of duty- motivated by the security and safety concerns of insurance companies requiring a strong signal as a pre-requisite of a favourable premium. Thankfully, there are now robust solutions in the market capable of capturing carrier signals from the outside and distributing them throughout the interior of large enterprise buildings. The systems that capture and distribute the cell signal were invented and pioneered by Phil Zeigler, a network engineer at the vanguard of cellular technology. Distributed antennae systems or DAS, will become ubiquitous around the globe in large enterprise level buildings, high rises, universities, work campuses, stadiums, and malls. The market is expected to expand from 600K to 1.5 million buildings with installed Direct Antennae Systems in the US alone by 2020. This is a conservative estimate given wireless data usage has grown exponentially in the past 5 years. Simultaneously, unlimited data plans are more in demand than ever before, and high speed cellular networks are expected to compliment or replace hard-wired fibre networks as 5G becomes a reality. provision of DAS remains an expensive and cumbersome process. Typical prices range from $3-6 per square foot, and require consent from competing carriers to utilize their signal. 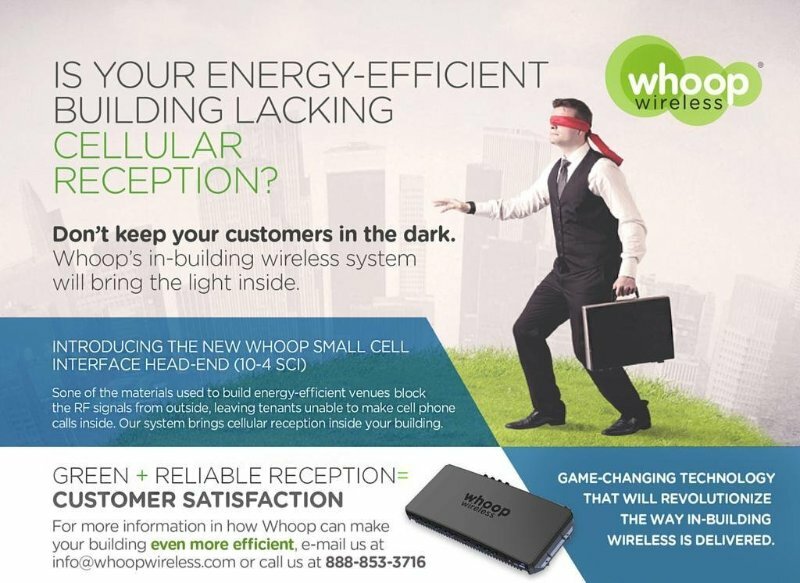 Whoop Wireless provides Distributed Antennae Systems at $1 per square foot. Furthermore, it can provide carrier agnostic software that does not require the long and arduous carrier consent process most DAS companies are bogged down with. Responsible for this new technology, the founders and leadership team of Whoop provide significant experience from senior positions from top 9 figure infrastructure, energy, and technology companies, and are pedigreed Ivy Leaguers with over a billion dollars of exits between them and a long track record of success. Current WHOOP clients include Google, Texas A&amp;M, Marriott, Holiday Inn, SMU, and more. They are in a rapid growth phase and expanding internationally. They are in a series B fundraising round , and actively accepting requests for quotes and installations of their ground breaking advancements in Distributed Antennae Systems.